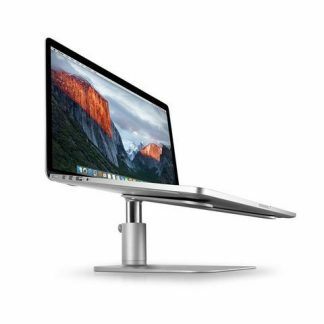 GhostStand floats your MacBook display over six inches off your desk or table to a more comfortable viewing height. Park any MacBook on GhostStand and pair it with your favorite full-size keyboard to enjoy the comforts of a desktop system. The criss-crossed blades on this nearly invisible stand allow for grab-n-go convenience. When you’re ready to pack up your MacBook and hit the road, simply unplug your power cable (and any USB cords) and go, leaving a mysterious sculpture behind. Take a close look at GhostStand and you’ll spot ultra-thin silicone rails on the top and bottom of this clear stand. Double-inlaid rails feature a narrow strip of silicone inset into a thin sliver of metal. The brushed metal rail is then machined into the lucite blades GhostStand rests on. Soft silicone rails protect your work surface and they grip the bottom of your MacBook to hold it in place while your work or play on your MacBook. 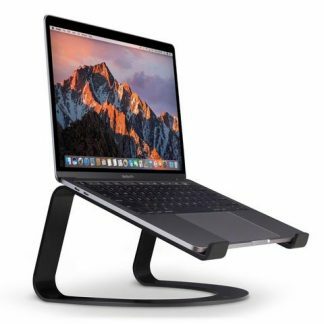 The thin, super light stand also improves air circulation around MacBook. Ghosts cut from the same sheet. GhostStand was inspired by the mind-bending shapes and materials of mid-century post modern design, as well as the iconic Ghost Chair by Philippe Starck. Imagine sitting in one of his ghost chairs while typing away on a Mac resting on a GhostStand. Sitting on a desk or table by itself, GhostStand looks like a modern sculpture, reminiscent of the impossible shape. Don’t be afraid, order your GhostStand today.